Filled with songs, fun, and lessons about becoming a "girl after God's own heart", this value omnibus pack is a must-have for every daughter of the King of kings! The Princess pack includes two Veggie stories that encourage girls to be happy to be themselves and understand the meaning of true beauty. VeggieTales Princess Girls Pack by Veggietales was published by VeggieTales in December 2016 and is our 3051st best seller. The ISBN for VeggieTales Princess Girls Pack is 5060424955770. 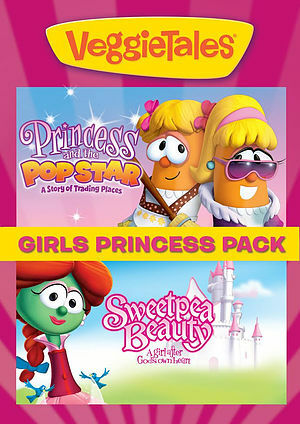 Be the first to review VeggieTales Princess Girls Pack! Got a question? No problem! Just click here to ask us about VeggieTales Princess Girls Pack. Hi, what region is this dvd disc? will it play in the UK? A:This is Region 2 DVD, and so will play in a UK DVD player. Thank you for using the Q&A Forum. How long does the DVD last? A:As both the DVDs in the pack have a run time of about 45 mins, this pack in total comes to about an hour an a half. Thank you for using the Q&A forum.